TYCO's 1993 Catalog is the final year to date that HO-scale model trains were listed. This 8-1/2" x 11" full-color publication contains 182-pages. The table of contents for 1993 lists TYCO's various product lines, which include: Radio Control; Boys Action; Electronic Racing; Electric Trains; Games; Activity Toys; Dolls; Blocks; View-Master; and Electronics. Don't blink or you'll miss TYCO's Electric Trains on pages 64 and 65 only. That's right, out of 182-pages, by '93 trains had dwindled down to two pages with only three train sets offered. 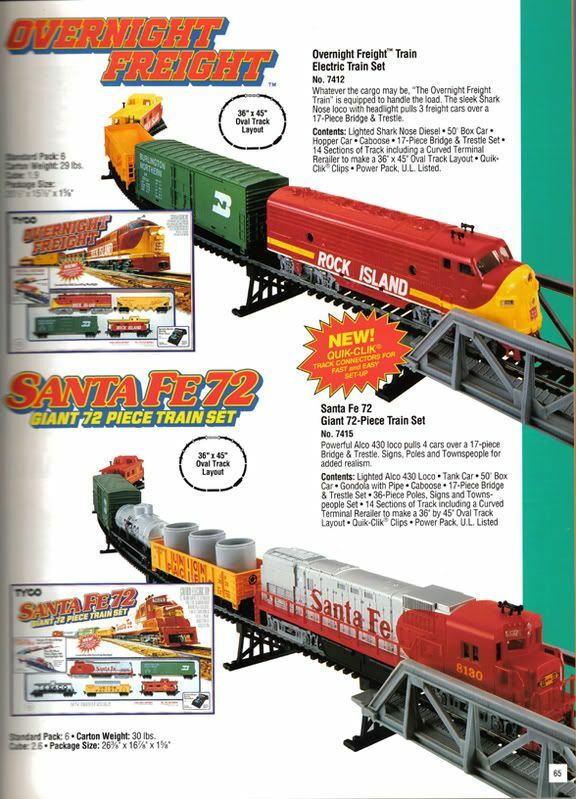 The final three train sets shown by TYCO in 1993 are: Railroad Empire II; Overnight Freight; and Santa Fe 72. Set #7436- Railroad Empire II is typical of this very late era TYCO product. The set box is pictured with a GP-20 on it. Inside the set box, you see a low-nose Century 628; while the display picture shows the Alco Super 630. All three are at least dressed in the same Santa Fe red-and-silver scheme. From my experience, this set is generally found with the Yugoslovian-made low-nose Century 628. The Century 628 is the same one sold by Life-Life, Model Power, AHM, and most recently IHC. Unlike the Hong Kong-made TYCO trains, the Yugoslovian items found in the late '80s and early '90s do not have TYCO's name on the bottom of the fuel tank. The freight cars are also Yugoslovian models that are similar, but not the same as TYCO's previous Hong Kong-made items. The next set in the 1993 catalog is The Overnight Freight- #7412. This one too suffers from a bit of an identity crisis. 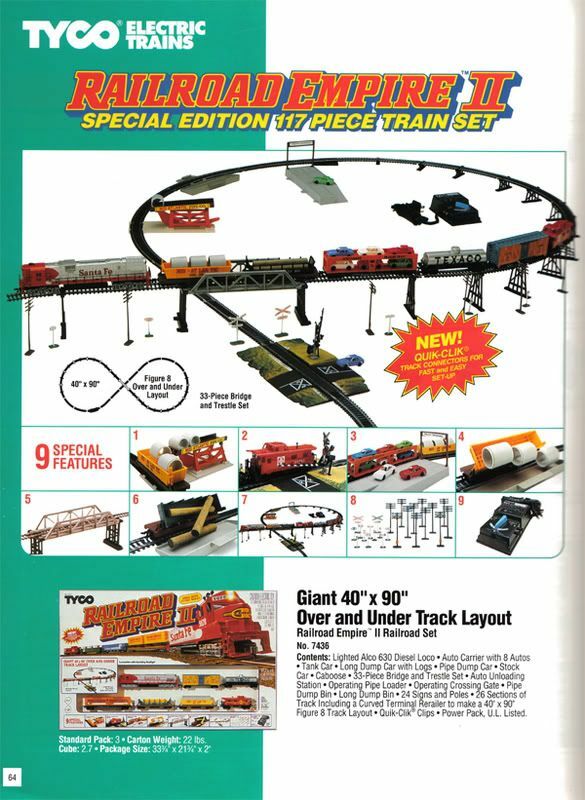 The train set box pictured in the catalog shows the Shark Nose diesel. Inside the box and in the display image, you see the Yugoslovian-made F-9A. Both models are in the red-and-yellow Rock Island paint. An additional note to collectors, this set is also found with an Alco FA-1 in place of the F-9A, which was in place of the Shark Nose. Both the F-9A and FA-1 are products of Yugoslovia and IHC has offered them, among others. The final of the three train sets for '93 is the Santa Fe 72- #7415. The same substituttion holds true for this set as it does for the others. The train set box shows a Santa Fe GP-20, while the set actually has an Alco Century. The Alco Century is not the same model made in Hong Kong and sold previously by TYCO. This one is also a Yugoslovian-made diesel. There are no separate items listed in the 1993 catalog. Only the three train sets detailed above are found in this publication. With regard to the Yugoslovian substitution items, the full story is not totally clear. Conversations with IHC representatives have lead me to believe that IHC purchased the remaining TYCO stock and rights to the molds sometime in the early '90s. I am not certain however if IHC played any part in these sets sold beginning in the late '80s that featured the Yugoslovian replacement items. Most all the diesels and freight cars found in these sets and made in Yugoslovia have been seen in IHC's line of products over the years. There is certainly a relationship between these final TYCO train offerings and IHC, but it is not completely clear.